The Krushùna Falls (Krushùnski Vodopàdi as they are pronounced in Bulgarian) are a karst cascade located near the village of Krushùna, some 34 km from the historical town of Lovech in north-central Bulgaria. The falls, located in an area known as Maarata, are the biggest travertine cascade in the country, unique with its picturesque scenery, lush vegetation, numerous round-shaped terraces and small natural pools with mineral water. The water in the area, with a temperature of 58 °C, has been found to have beneficial effects on rheumatism, skin problems and gynecological conditions among others. 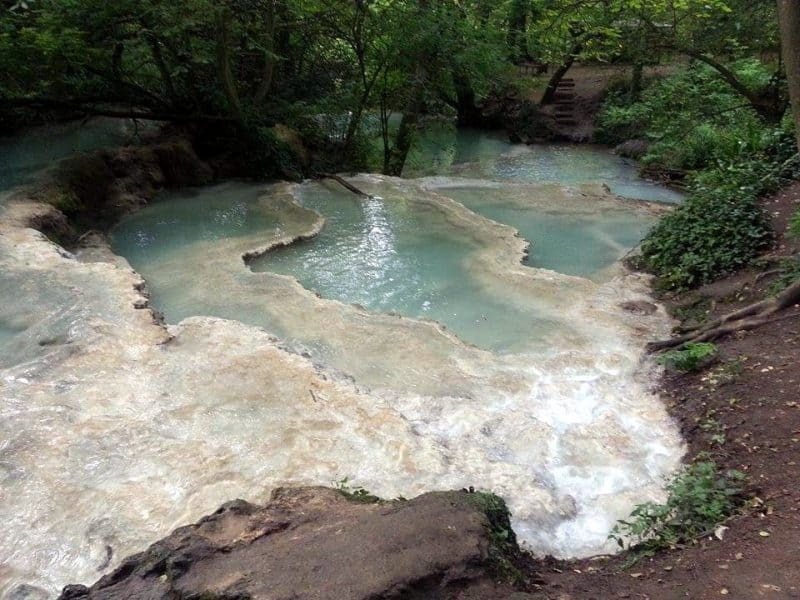 For centuries local people have believed in the healing power of these waters, and many still go to the falls to do a ritual for good health on Saint George’s Day (nowadays celebrated on May 6). Before sunset on that day people go up to the spring of the falls where there is a small natural tunnel and crawl through it three times. Afterwards they collect drops of water from the rocks and wash their eyes with them, and then they repeat a sort of incantation three times. In the rocks around the Krushùna Falls one can spot a few ancient caves that were inhabited by Christian hermits practicing Hesychasm, an Eastern Orthdox mystical tradition of prayer in solitude and seclusion, in the XIII – XIV centuries. There is even a small church carved into the rock and some believe that it was part of a whole monastery, called the Krushùna medieval monastery. 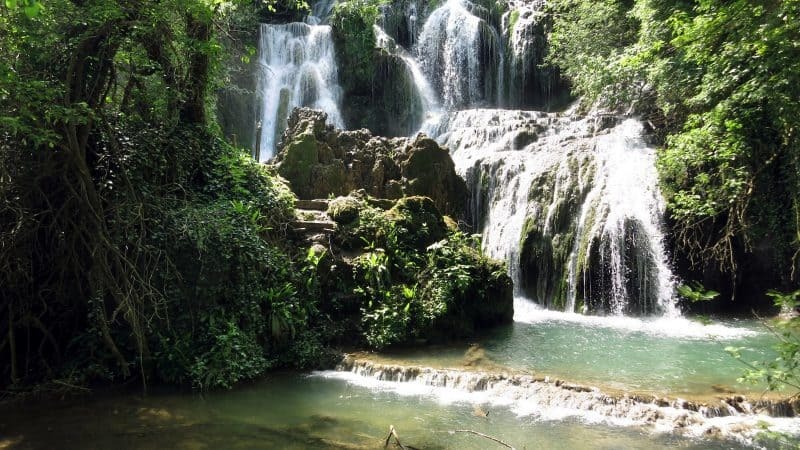 The Krushùna Falls offer an excellent opportunity for a one-day escape from the city, especially during the hot summer months when one can enjoy a nice walk up the cascade and a refreshing dip into the natural pools along the way. However, this is best done during the week, as on weekends the place is often full of tourists looking to cool down in the heat. The falls are easily accessible by car from the main Road 301, and there is also public transport from Lovech to the village of Krushùna. To reach the falls from the parking lot and the village it is a pleasant 20-minute walk. Then it is another 30 to 45 minutes to get to the spring depending on the time one takes to marvel at the sights along the way. Visitors are charged a symbolic entrance fee. Another site that you should not miss while you are in the area is the picturesque Devetàshka Cave, just a few kilometres away along the main road. I’m a bit confused, are there HOT springs as well? Cause looks like that from the article but I can’t find info about or either a itinerary to reach those. Thanks! We have done self guided inn to inn hiking at many locations around the world and are wondering if such a thing exists in Bulgaria. We would also consider a guide in Bulgaria if there are few English speaking local people. We prefer to hike 6-15 miles per day and carry only a day pack with water, lunch, and foul weather gear. Our overnight gear is transported for us between evening destinations. Our schedules are somewhat flexible and we would probably have 4-6 people in the party. We would like the hike to be in the 6-9 day range. Does this sound possible for a Bulgarian vacation?